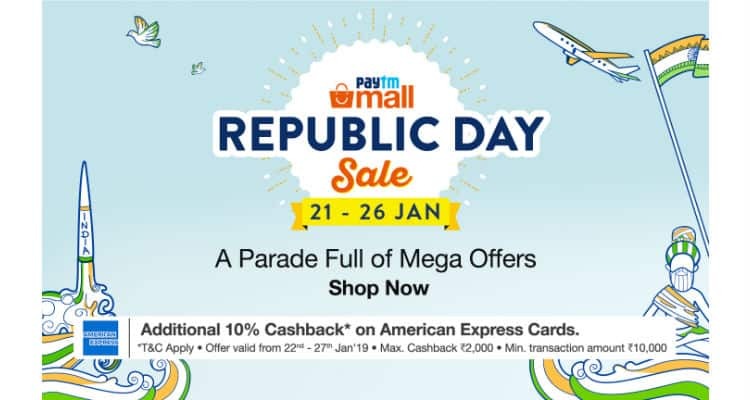 Paytm Mall Republic Day Sale Comes as a Pleasant Surprise for Smartphone Enthusiasts! The Paytm Mall ‘Republic Day Sale’ has come as a pleasant surprise for smartphone enthusiasts across the country. The sale has effectively slashed the prices of in-demand smartphones from top brands like Apple, Vivo, OPPO, Google, Redmi, Samsung, and more by as much as 30% off of their MRP. Some of the best offers currently available on the platform include iPhone X (64GB) which is effectively available for Rs. 73,039 on the platform – Rs. 18,500 less than its original price tag of Rs. 91,900. Lenovo K8 Note (32GB) can be effectively purchased by Paytm Mall customers for nearly half its price with 43% discount and an additional 10% cashback. Google Pixel 3 (64GB) has also shed its price by Rs. 12,680 effectively and is available for Rs. 58,320 following a 9% discount and an additional cashback worth Rs. 6,480. On the other hand, several in-demand smartphones including Samsung Galaxy J6, Nokia 6.1 (3GB + 32GB), and Honor 9 Lite (64GB) can be purchased with an effective price drop of more than 33%. The excitement has also been added by making Bluetooth headphones available under Rs. 1,999, Bluetooth speakers under Rs. 2,999 (including the all-new Echo Dot 3rd Gen), and wired headphones under Rs. 999. So, if you were planning to buy yourself a new smartphone or some amazing accessories such as headphones, speakers for your aural pleasure, Paytm Mall seems to have given you the perfect opportunity to do so this Republic Day. All smartphones on the platform are covered by a minimum of 1-year manufacturer’s warranty on the phone and a 6-month warranty for box accessories. Also, there are a host of add-on services that you can buy to maximize protection for your beloved purchase. All offers are subject to stock availability. Hurry, before the stocks run out. Log on to Paytm Mall now!